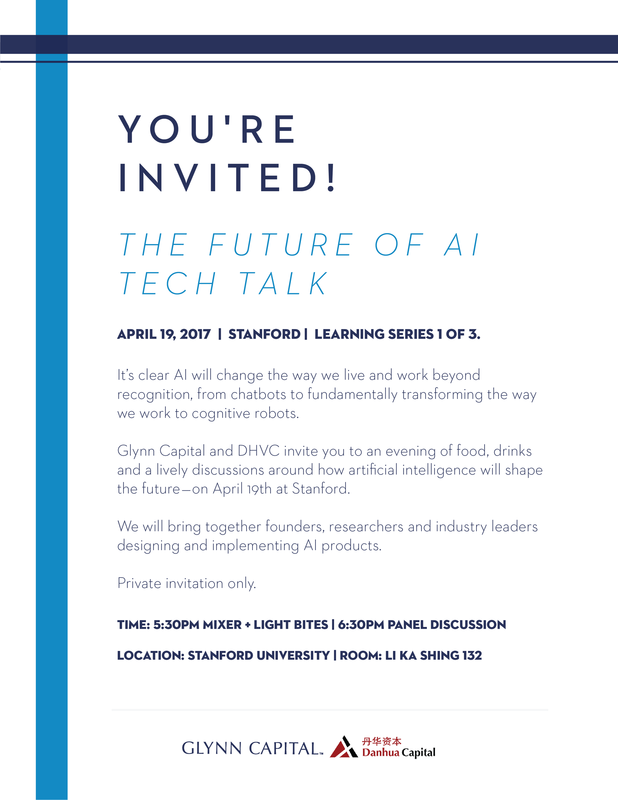 Learning series (part 1 of 3) for startups, researchers, students and Industry experts working on the future of artificial intelligence. Join us for light refreshments (pizza & drinks) during the first 30 minutes to meet the speakers, event hosts and other attendees. Dan helps the founders and leadership teams of companies with disruptive and high-growth potential mitigate their biggest strategic risks and develop absolute clarity on the best possible go-to-market strategy for their product, market, and stage of growth. Dan has served in numerous marketing roles for Salesforce, Twilio and Asana. Dan is our emcee for the evening and we are thrilled to have him! John Glynn is a professor at Stanford University Graduate School of Business, University of Virginia Darden School of Business and the founder and General Partner of Glynn Capital Management, a venture capital fund, in Menlo Park, CA. For the past three years he has also taught a class in entrepreneurship at Cambridge University’s Graduate School of Business. Mr. Glynn is a member of the Board of Advisors of the Arts and Letters College of the University of Notre Dame, the Advisory Board of Cambridge Business School, and is a Trustee of the University of Virginia School of Law. He has been active in the venture business on a national basis since 1970. John Glynn’s research interest is studying organizations and cultures in early stage technology businesses. This interest is based on his experience as a venture capitalist for 37 years investing in those types of companies. He previously invested in Intel, Sun Microsystems, Electronic Arts, LinkedIn and Facebook. Professor Zhang is the founding partner of Danhua Capital (DHVC) and a tenured professor in the Department of Physics, Department of Applied Physics, and Department of Electrical Engineering at Stanford University. He is a fellow of the American Physical Society, the American Academy of Arts and Sciences, and the National Academy of Science. Because of his pioneering research on Spintronics and Topological Insulator fields, he was granted the Guggenheim Fellowship in 2007, the Humboldt Research Award in 2009, the EPS CMD Europhysics Prize in 2010, Qiu Shi Excellent Scientist Award in 2011, the Oliver E. Buckley Condensed Matter Prize by the American Physical Society in 2011 and the Dirac Prize in 2012. In 2013, he and Stephen Hawking was given the Physics Frontiers Prize. In addition, he won the Thomson Reuters Citation Laureate in 2014 and the Benjamin Franklin Medal in 2015. He is also an experienced angel investor. He previously invested in VMware and DivX. Otavio Good is a software engineer at Google Translate, where he works on machine learning and computer vision. Previously, Otavio founded Quest Visual Inc, which was acquired by Google. Quest Visual made the smartphone app Word Lens, the first augmented reality language translation app that translates text in real-time video. Otavio previously co-founded video game company Secret Level, which was acquired by Sega in 2006 and became Sega Studios San Francisco. He led the team “All Your Shreds Are Belong to U.S.” that won the DARPA Shredder Challenge in 2011. Otavio also loves working on side projects related to computers, math, science, and technology. Kurtzig is also an angel investor, with successful investments including StubHub (acquired by eBay) and iLike (acquired by MySpace), and an active philanthropist, with a passion for finding a cure for juvenile diabetes. When he’s not working, Kurtzig’s interests include spending time with his wife and his three young children and adding to his collection of Hawaiian shirts, which he wears daily. Dan is the Co-founder and CPO at Neva. Dan was formerly at ServiceNOW and Big Panda. Dan will lead a discussion on where AI in IT is going and how how his company, Neva is disrupting IT customer service and support. AutoX aims to solve autonomous driving cheaply and robustly with major customer impactful way points on the way. Jianxiong Xiao, founder & CEO at AutoX, was an Assistant Professor in the Department of Computer Science at Princeton University and the founding director of the Princeton Computer Vision and Robotics Labs from 2013 to 2016. He is a pioneer in the fields of 3D deep learning, autonomous driving, RGB-D recognition and mapping, big data, large-scale crowdsourcing, and deep learning for robotics. He received his PhD from the Computer Science and Artificial Intelligence Laboratory (CSAIL) at the Massachusetts Institute of Technology (MIT) in 2013. Since its founding in 2014, Kindred has been exploring and engineering systems that enable robots to understand and participate in our world, with the ultimate goal of enabling a future where intelligent machines work together with people to create abundance shared by all. We will wrap up the night with a final Q&A session with our speakers on a panel. We will conclude the night with an opportunity for guests to meet the speakers on site.